In 2012, the Danvers, Massachusetts North Shore Community College (NSCC) campus opened its new 58,000 square-foot Health Professions/Student Services Building. 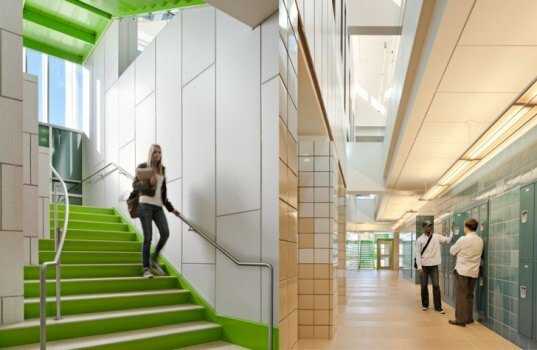 Designed by Boston/Seattle-based DiMella Shaffer, the Health Professions/Student Services Building was designed to LEED Gold standards and it's the first educational building to be designed to the Zero Net Energy Building (ZNEB) standard in Massachusetts. The feather in the project’s cap is that this building is actually the fourth largest ZNEB in the United States! The Commonwealth of Massachusetts is the proud owner of this new ZNEB building, and in partnership with the Department of Capital Asset Management, Governor Deval Patrick brought together the team of architect DiMella Shaffer and construction manager Walsh Brothers Construction. NSCC President, Wayne Burton knew that “as an educational institution, [they had] an obligation to be a regional leader in many ways, and one is to make sure that [they taught their] students by example”. President Burton challenged the team to look at this building as an opportunity to urge the NSCC students to think about conserving resources. The conservation of resources for this project started through careful site consideration based on solar orientation. The DiMella Shaffer team also tackled the task of achieving zero net energy through the following three energy design strategies: minimize energy loss and heat gain by designing most energy efficient exterior building envelope, maximize the use of natural daylight to reduce electrical demands, and reduce energy usage by specifying highly efficient mechanical and electrical systems. Clerestory windows, interior and exterior light shelves, efficient geothermal heat pumps, energy recovery units, grey water systems, high performance lighting, chilled beam technology, and a radiant heating/cooling system were all strategies that the team implemented to achieve a highly energy efficient building. The $24 million budget seemed to be enough to design the building to achieve all programmatic needs and achieve at least LEED Gold requirements, but the team believed that additional funding would be necessary to achieve ZNE. Therefore, as a model project identified by the Governor’s Council on Sustainability, alternative funding sources were allocated by the State to add a photovoltaic design solution. DiMella Shaffer designed the building to be dramatic utilizing a truss structure supporting visually interesting 1088 photovoltaic solar panels on the building’s roof along with three solar panel canopies leading to the main entry. Working with the sustainable engineering companies of Buro Happold and Solar Design Associates the solar panels mounted on the trusses help to “celebrate” the importance of the on-site electrical generation and helped to secure the necessary energy savings through electrical generation. 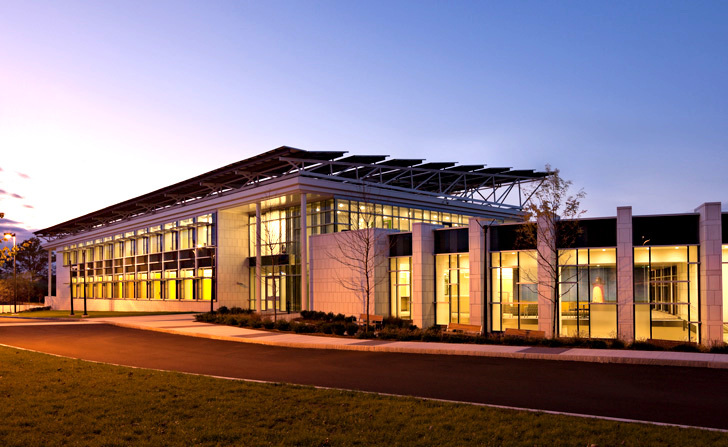 DiMella Shaffer designed the building to be dramatic utilizing a truss structure supporting visually interesting 1088 photovoltaic solar panels on the building’s roof along with three solar panel canopies leading to the main entry. A green-roof system was also designed into exposed portions of the roof. 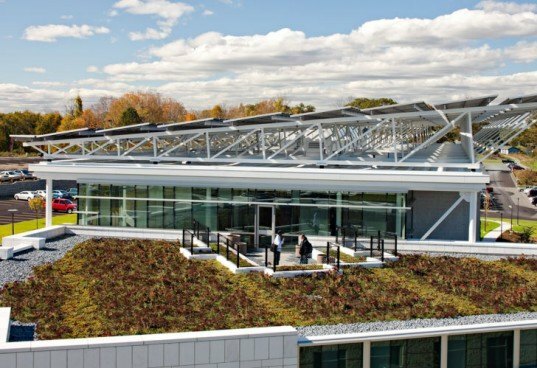 Efficient geothermal heat pumps, energy recovery units, grey water systems, high performance lighting, chilled beam technology, and a radiant heating/cooling system were all strategies that the team implemented to achieve a highly energy efficient building. The $24 million budget seemed to be enough to design the building to achieve all programmatic needs and achieve at least LEED Gold requirements, but the team believed that additional funding would be necessary to achieve ZNE. As a model project identified by the Governor's Council on Sustainability, alternative funding sources were allocated by the State to add a photovoltaic design solution. The DiMella Shaffer team also tackled the task of achieving zero net energy through maximizing the use of natural daylight to reduce electrical demands. Clerestory windows and interior and exterior light shelves were two techniques that the design team employed to manage the amount of solar gain allowed in different areas of the building. The team also minimized energy loss and heat gain by designing most energy efficient exterior building envelope. NSCC President, Wayne Burton knew that “as an educational institution, [they had] an obligation to be a regional leader in many ways, and one is to make sure that [they taught their] students by example”. The comfort of the interior spaces was never sacrificed throughout the project. The team also introduced the sustainable strategy of reducing energy usage by specifying highly efficient mechanical and electrical systems.